This very compact garden storage unit is created to hold your gardening essentials. It offers an incredible space saving design, making it perfect for any size garden. Though it has a small width and depth, the height of this building is impressive, aiding with tall tool storage. An apex roof adds to the interior height, whilst also delivering exceptional rainwater protection. Costs have been lowered thanks to the solid sheet floor and roof, while the exterior benefits from strong tongue and groove cladding. The shelving featured on the photo does not come with the unit. It is purely for illustration purposes only, highlighting how you can use the building. The single braced door covers the entire front of the unit. So you have incredible access to your bits and bobs. It doesn’t have a window and the door is fitted with a pad bolt. Due to the strength of the solid sheet floor, it is not recommended you store anything heavy. However, you can improve its strength with the extra strength support pack offered as an extra. 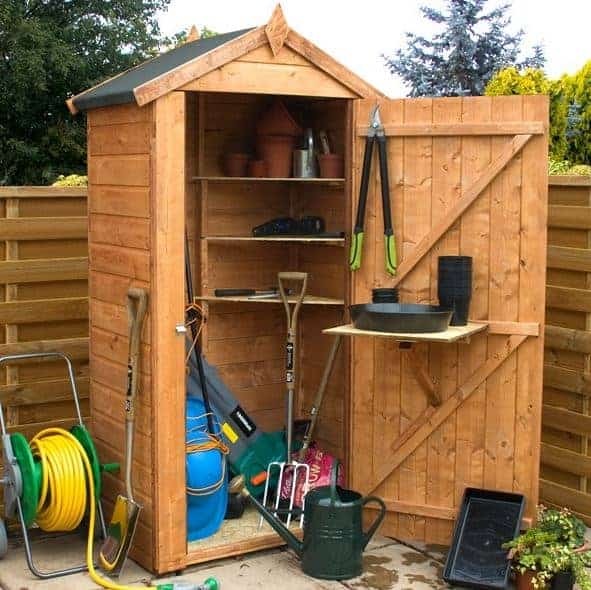 If you only have a small amount of garden storage, this is definitely a great unit to consider. It offers a sturdy, tough design and the ability to add shelves further enhances its storage capacity. This is one of the smallest wooden storage sheds available and it benefits from a unique, tall design. As it is so small and it only features a solid sheet material floor, it is only suitable for lightweight storage. You won’t be able to fit anything bulky in this building, but it will easily accommodate tall tools and equipment. It also isn’t a walk in building. As you open the door, you have instant access to everything within arm’s reach. 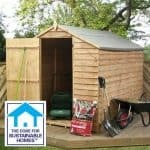 If you’re looking for a small, secure place to keep your gardening bits and bobs, this is a fantastic shed to opt for. As you can see, the height of this shed is fairly dramatic when you compare it to the depth and width of the building. What’s interesting to us is that the door is a lot wider than the actual depth of the building. 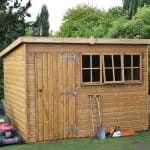 Compared to other buildings, the door actually has a standard width, but due to the measurements of this particular shed, it ensures you have maximum access to the contents. 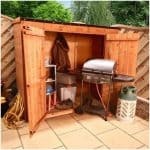 It also opens out to almost the entire width of the shed, giving you extremely easy access to your storage. We love that this little shed features an apex roof. It is one of its main design features and provides two important benefits. The first is that it does not allow rain to collect on top of the roof. Rainwater runs down straight onto the ground, reducing the risk of rot. The second benefit is that it boosts interior height. It is what makes the shed so tall and allows you to store taller equipment. Add to this the fact it is covered with a strong mineral felt and you have a very sturdy and water resistant roof. It is made with 8mm solid sheet materials so it could be sturdier. However, as it is a small building the tough tongue and groove cladding helps to keep the entire structure of the shed very stable. A floor is supplied with this building, though like the roof it is made from solid sheet materials. It is a little thicker however, measuring 10mm. We’d usually find this a concern as it is really only strong enough to hold light equipment. 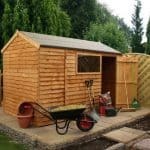 However, as you can’t fit anything particularly bulky in this shed anyway, you should find the floor is strong enough to hold your items. Even though this is a very small storage shed, Waltons have made sure its walls are incredibly tough. Using 12mm tongue and groove cladding, the exterior of the building is thick, solid and water-tight. It may not be as strong as Shiplap, but this tongue and groove style cladding still comes with an abundance of impressive features. Tongue and groove is a lot more reliable than overlap and it is less prone to warping. It also offers protection against warping in the form of an expansion gap. You see this design on laminate flooring. Each panel is equipped with a tongue at one end of the timber and a groove at the other. This makes assembly a breeze as the panels literally just slot and lock into place. They create a tight interlocking system, preventing rainwater from leaking inside the building. It’s additional strength and longevity does come at a slightly higher cost than overlap, but it’s definitely worth the extra money you pay. Another brilliant feature is the framing. No matter what size building they manufacture, Waltons typically use a 28mm x 28mm frame. This little shed is no different, though because it is so small, the frame provides much more stability than it does in larger buildings. Annual treatments are recommended, whether you decide to use water or spirit based treatments. However, the good news is that unlike larger sheds, maintaining this one is quick and easy. It won’t take long to give it a coat or two of treatment and as it is so small, a single tub of treatment will provide a couple of year’s protection at least. Waltons even include a free 5L tub of water based Golden Brown treatment so you can actually save quite a lot of money providing you are happy to use this particular colour. What we’d recommend is using a spirit based treatment, leaving it to dry and then using a coloured water treatment over the top if you really want a different coloured finish. If you’re happy with the unpainted design then a single spirit treatment would be more than sufficient. The reason we recommend these over water treatments is because of the increased amount of protection they offer. They form a deep internal water resistant barrier, as well as a surface barrier. All of the outdoor wooden buildings from Waltons come with a 10 year anti-rot guarantee. So as long as you keep up with the treatments, the building is protected by this warranty. A single, standard 0.75m width door opens out to provide instant access to all of your storage. As the building isn’t very deep, you can literally reach everything from the doorway. It comes with the popular Z bracing, ensuring it will withstand heavy daily use. It has a sturdy build, just like the walls of the shed and has a pad bolt to keep the door closed. No windows are included so you can be sure that your storage is totally covered away from prying eyes. The security isn’t great on this building, but that’s because it isn’t designed to hold anything of any real value. It’s purely offered for use as a general storage facility for gardening items. This could include plant pots, compost, rakes and garden shears. If you’re simply storing your non-valuable gardening tools, you won’t need to invest in a lock. However, there is one available as an extra if you prefer. Security wise everything is kept out of view thanks to the windowless design. This also gives the shed more of a secure look and feel. Considering how small this shed is, we’re surprised by the amount of customisation options and extras available. If you’re looking to upgrade the quality of the roof, the superior duty felt is a good investment. It is made with a long-lasting design and unlike the heavy duty felt it will not perish. This is down to the great fibreglass construction. It benefits from a brilliant textured finish, adding a more decorative style to the roof. There’s also olive green and charcoal colours available. As it is self-adhesive, you will find adding it to the building extremely easy. The treatments are another way to customise how the shed looks. There’s a large collection of colours to choose from including Sage, Country Cream, Harvest Brown and Holly. 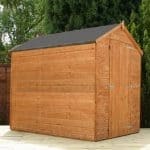 However, we’d recommend using the free Golden Brown treatment supplied with the shed as this will save money as well as provide a more attractive finish. Out of the extras available, there’s really only one we’d recommend. This is the 49mm weatherproof padlock. It will obviously help to improve the security of the shed and it will fit instantly onto the pad bolt fitted on the door. It’s a small extra, yet it provides huge benefits. Its unique tough weatherproof design means it won’t perish even when exposed to harsh rainy conditions. This is largely thanks to its incredible Thermoplastic weatherproof jacket. It is also sold with a free hasp and staple so this is an added benefit. We’re surprised to see that shelving sets are offered as an extra. Considering the width of the building is only 3ft, fitting the smallest sized 3ft shelving sets into the building will be a tight squeeze. They are also likely going to make the building look more cluttered. So instead if you do want shelving, we’d recommend installing slightly shorter shelves on the interior walls like the ones shown in the picture. We’re really impressed by the high quality design of this compact storage shed. Instead of just using cheaper overlap cladding, Waltons have made use of tongue and groove construction for great durability. The frame of the building is also incredibly sturdy and provides great rigidity. Tongue and groove isn’t as long lasting as Shiplap, but it is still a very durable construction type. With annual treatments, this shed will last for many years to come. It’s no surprise this has received a fairly low rating due to its compact size. However, keep in mind that you can add more storage space in the form of interior shelving. One of the main advantages of such a compact building is that it is extremely easy to build. You can assemble this by yourself with no problems. The panels aren’t heavy, though as it’s a tall building you may struggle a little. Overall though you’re provided with everything you need and you should also find it quick to erect too. 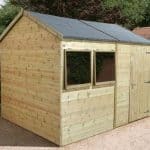 If all you require is a small amount of storage for your bits and bobs, this durable shed provides great value for money. It’s got some great features and as the tubs of treatment will last a few years, this leads to further cost savings. Final Thoughts: Built to fit in any size garden, this beautifully compact storage unit boasts a strong and practical design. It comes with some really great features including a pad bolt, 12mm tongue and groove cladding and a stylish apex roof. It is a tall building, making it ideal for storing taller tools such as rakes, brushes and shovels. As sold, it is purely designed to hold lightweight storage, but you can upgrade the floor to enhance its capabilities. A 10 year anti rot guarantee is included, though you will need to meet the treatment requirements in order to benefit. All in all this is a fantastic little storage unit that comes at a really affordable price.